Had a couple of people ask how I did the chipped armour effect on this chap (above), so I have decided to put together another tutorial on this subject. Chipped armour effects and other painted texture effects, also sometimes referred to as trompe l'oeil (French for "trick of the eye") can sometimes be tricky to get looking right, especially on white or black backgrounds due to a difficulty in creating the necessary contrast or definition for the effect to work. Sponge - Applying the "chipping" colour using a piece of sponge or blister foam. Liquid Latex Mask - Applying liquid latex mask (Vallejo being my personal preference) to a surface painted with the desired "chipping" colour, before covering the entire surface with the overall desired colour and then gently removing the liquid mask with an eraser of cloth to reveal the chips. Both techniques are fairly easy to do, with the sponge method undoubtably the easier and quicker of the two, yet I find it best to use a mixture of both to get a good variation in the size of and randomness of the chips. The following tutorial looks at the sponge method, however the liquid latex technique is fairly similar in terms of application. So without further preamble, lets get down to it! The first step in the process is rather obviously to prepare the surface the chips will be applied to. In this example, the chips are being applied over a white surface, which requires a little extra thought. Rather than simply applying the chipping to a perfect white surface, the white needs to be shaded a little first in order for the effect to work properly when it comes time to highlight the edges of the chips, but more on that later. In this instance, the white was shaded with a mix of a touch of a heavily thinned touch of Vallejo Basalt Grey and Games Workshop Asurmen Blue wash (not very visible in the pic). Arming yourself with some sponge or blister foam (blister foam is free and a good size for the job! ), choose an appropriate colour for your chips, bearing in mind that strong contrast, but not "too" strong is what we are after. 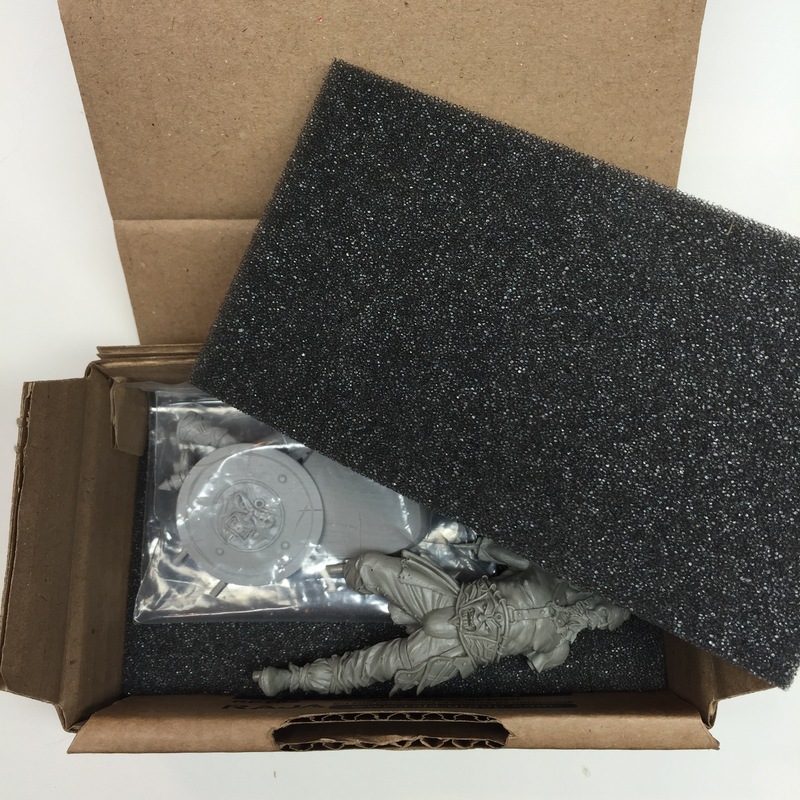 For this example, I'm using GW Charadon Granite, a nice dark grey/green/brown which fits well with the fatigues on the figure. When applying, get some paint on the sponge, then dab it against a piece of tissue to remove any excess paint that would spoil the effect, then lightly apply focusing on the edges of armour plates and areas that would receive natural wear and tear. As you can see in the pic above, it can be a bit of a messy effect, so consider applying the chips before finishing the surrounding areas. Now that the chips have been applied, it's time to work on making them look realistic and creating the "trick of the eye". To do this, we need to start applying some simple lighting effects to the chips. To do this, mix some black with the chip colour from earlier and using a fine detail brush, apply some of this colour in a thin line around the top (relative to the direction light would be falling) inside edge of the chip to simulate shadow from the lip formed by the layer of paint that has been chipped away. Next, apply a thin line of white (or white mixed with your overall surface colour) to the bottom outside edge of the chip. This simulates light catching the raised edge of the paint where it meets the chip, adding to the realism. To go one step further, you could fill in some of the larger chips with some metallic paint (GW Mithril Silver being my preference) to get the look of chips and scratches going right through both paint and primer to expose the bare metal of armour plates. Thats pretty much it. As I said, easy and quick to do! Realised I never posted this here. Had originally done the tutorial for my good friend Grey_Death over at The Painting Corp (great blog, go check it out if you haven't already! ), but thought I'd re-post here for completeness sake seeing as I'm trying to catalogue tutorials here. Following his recent acquisition of some clay shapers, coupled with his first forays into sculpting with Green Stuff, Grey_Death was kind enough to ask me to contribute a tutorial or two on sculpting. Having never written a proper tutorial before, I hope you will all forgive the inevitable mistakes I will make along the way! There are a few core sculpting tools that all sculptors should have. Below is a list of the tools I use along with their uses (See image 1. below). 1. Pin Vice - Used to drill holes for pinning and creating holes (for mesh, gun barrels etc). 2. Jewelers Files - Nice, small files for filing down plastic/resin/metal/cured putty. Good for making sharp edges in cured putty. 3. Clay Shapers - Used to shape putty and smooth surfaces. I mainly use the white chisel headed one to do most of the shaping and smoothing, with the bullet headed one being used for concave shapes and creating folds etc. 4. Metal Sculpting Tools - These are from a cheap Gale Force 9 set. The tool with a half round on one end and a blade on the other gets used a lot to blend putty into other surfaces (cured putty/resin/metal/plastic etc). The pointed tool is used to create fine details and small holes, hair, rips etc. 5. Scalpel - Used to cut plastic/resin/cured putty into shape and to remove any excess putty. 6. Paper Clips - Used as pins for pinning figures and as armatures for sculpting over. 1. Fimo (Champagne) - I haven't actually used this yet, but it comes highly recommended. A good material to practice with as it doesn't cure unless baked. When working with it, keep your work sealed in a jar in a shaded area to avoid any dust getting on the putty, or any accidental smudging. 2. Green Stuff - The putty of choice for most sculptors. A 2 part epoxy resin that requires mixing before use. Can be mixed in different ratios in order to achieve a variety of sculpting times. The more yellow, the softer the mix will be and the longer the curing time, the more blue, the harder the mix will be and a shorter curing time. Knead thoroughly to ensure no lumps of yellow or blue otherwise they will ruin the finish as they won't cure properly. 3. Brown Stuff - Like Green Stuff, but a much firmer putty and more solid when cured, making it better for doing hard edged surfaces and mechanical parts. 4. Milliput - Super Fine - Used to bulk work on bases and also for making "Milliput washes" (milliput mixed with water), which are used to fill small impurities in resin and metal sufaces, and also in putty work. 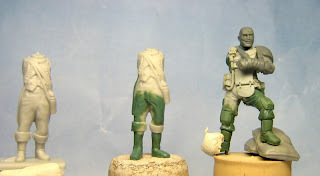 Washes can also be used in a thicker mix to fill small gaps and seams in sculpting and conversion work. 5. 1200 Grit Wet Dry Paper - Not a putty, but another tool used in conjunction with the putty. Used to sand surfaces to get a super smooth finish. I tend to sand all surfaces with this before painting in order to have a perfect surface to paint over. When sculpting, it can be used to sand out and seams and get a flush surface between putty and plastic/resin/metal/cured putty. Now that, that is out of the road, on with the sculpting! 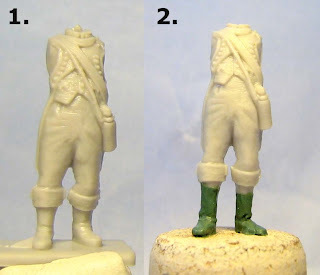 The subject for this tutorial is a Victrix plastic Napoleonic Frenchman (example 1. below) which I am converting into a Rogue Trader. 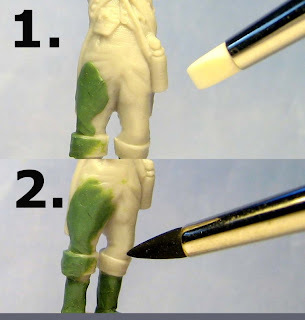 As the Victrix figures are a good deal smaller and thinner than Games Workshop's plastic figures, I will be using Green Stuff to bulk the figure out and to sculpt new feet in order to add some height to the figure. As can be seen in example 2 above, I have started by creating a rough base shape to work over for the feet. This was created by removing the original figures feet and putting two paper clip pins into the legs, running all the way down into the cork base. The rough shape of the feet was then built up over the paper clips and left to cure overnight. I always use a cork as a holder for sculpting projects as it is easy to push the pinned feet of models into, providing a nice large surface to hold onto that keeps your fingers away from the putty while you work on it. Champagne corks are best as they are nice and wide and have a nice flat, wide base to provide a stable surface for your work to stand on when you leave it to cure. Putty is then added to the base work (See example 1 above) in order to add volume to the shape along with some basic details. 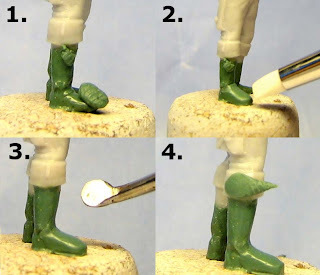 The putty is then shaped and smoothed to form the shape of a booted foot (See example 2 above). No folds or creases are added on the boot at this stage as I find it easier to add these seperately once the shape is formed and cured. Where the freshly applied putty meets cured putty from the previous stage, the edges are smoothed into the previous layer using the half round end of the metal sculpting tool (See example 3 above). This is done with the metal tool as clay shapers aren't hard enough to press the putty flush, therefore leaving a fine seam that can show up in painting. The result of the smoothing with the metal tool can be seen in image (See example 4 above). I began bulking out the legs, applying putty to one area at a time in order to provide room to work (1). The edges were smoothed with a metal tool before the bullet tipped clay shaper was used to add some folds around the knee and groin (See example 2 above and 1 below). There are a few small imperfections in the putty on the thighs (See example 1 above), these will be filled with a milliput wash later and then sanded smooth. 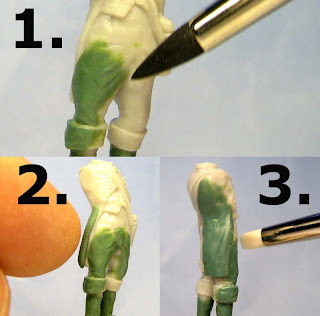 Putty was then applied to bulk out the jacket, pressed on into shape first with fingers (See example 2 above). The putty was then shaped as above, using the chisel tool to shape and smooth, the metal half round to smooth the edges into the plastic, and the bullet tool to create some light folds (See example 3 above). As you can see, there is still a lot of work to do before the figure is finished, there is still a fair bit of shaping and volume to be added, along with the all important details, however these will be covered at a later time in a future tutorial on sculpting details. Thanks again to Grey_Death for the opportunity, and thank you for reading. I hope that whether you are just starting out at sculpting, or if you have been sculpting for a while now, you will have picked up something of use here. First up:- Little Green Monsters - Some truly amazing sculpt work on show from this man and sound advice about tools and putty mixes too, check it out! 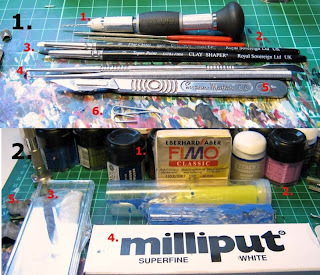 Secondly:- The Painting Corp - Amazing collection of tips, tutorials and advice on all things modelling. The frequency of updates mean there is always something new to read and the community around the blog ensures valued discussion. Run exceptionally well by some great guys. Thirdly:- Dave Taylor Miniatures - Great guy and a fantastic modeller. His production rate is so high that in the space of a week he will have finished a new army in time for the next post! His blog also seems to send a lot of traffic my way, so thanks for that Dave! There are a load more sites and blogs I intend to add to this at some point, these are just the ones I've been admiring lately, so go on, check them out!